1} hearts | 40% of profits go to charity + a gift for you w/ purchase. 4} "reaching for your hope", graphite, watercolor, letterpress, ink, pinholes, on paper, 5 in. x 7 in. 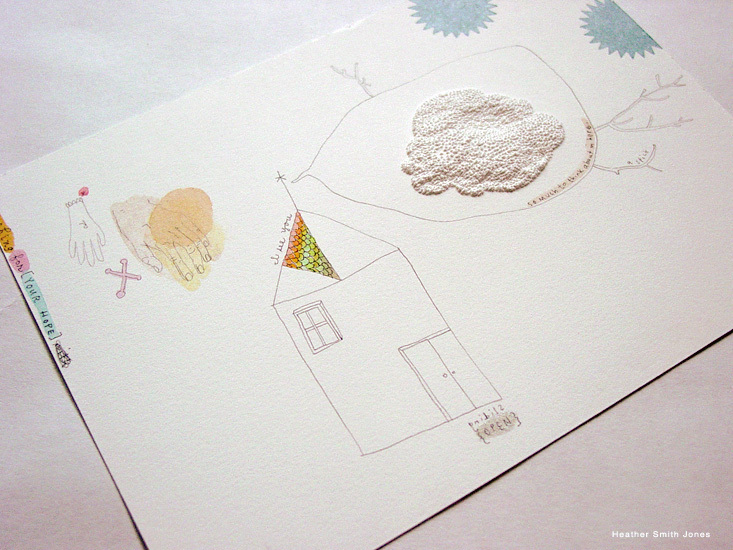 The shop is updated with new letterpress work, hand-sewn sequin hearts, and a new mixed media piece. It's been so much fun putting together these initial holiday items. I'm planning a few more hearts and letterpress cards. Do you see the two blue starburst shapes in my drawing in the bottom image? I just began working on a new card using that type and already really like it.